Do you ever feel like your kid’s parties are stressful? Keeping kids occupied is typically the biggest stress when hosting a children’s party. Because of this I tend to plan way too many activities for the kids than we ever use but I like to be prepared. Since this dino dig kept them busy for nearly an HOUR just a couple of games rounded out the party nicely. Read on for fun and simple Dinosaur party activity ideas…. 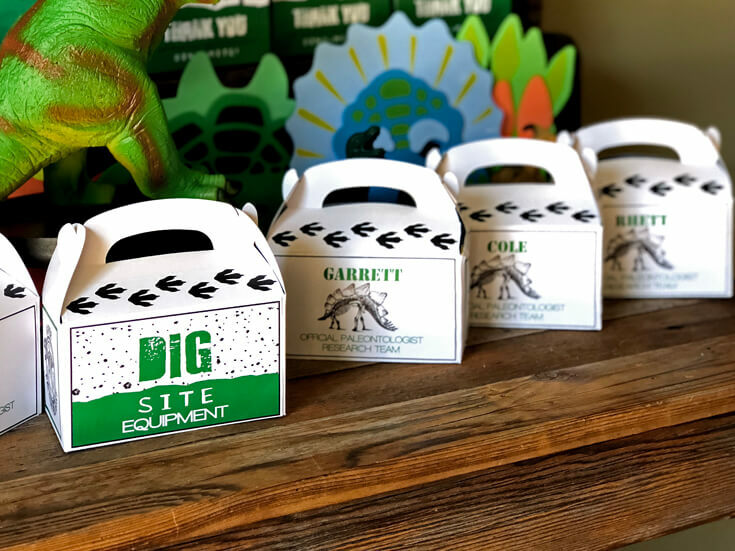 The biggest question for all our guests was “Can you dig it?” With their best dinosaur roar, we confirmed all guests were prepped and ready to go! First stop…. While we waited for all the guests to arrive each person had a chance to feed the T-Rex. 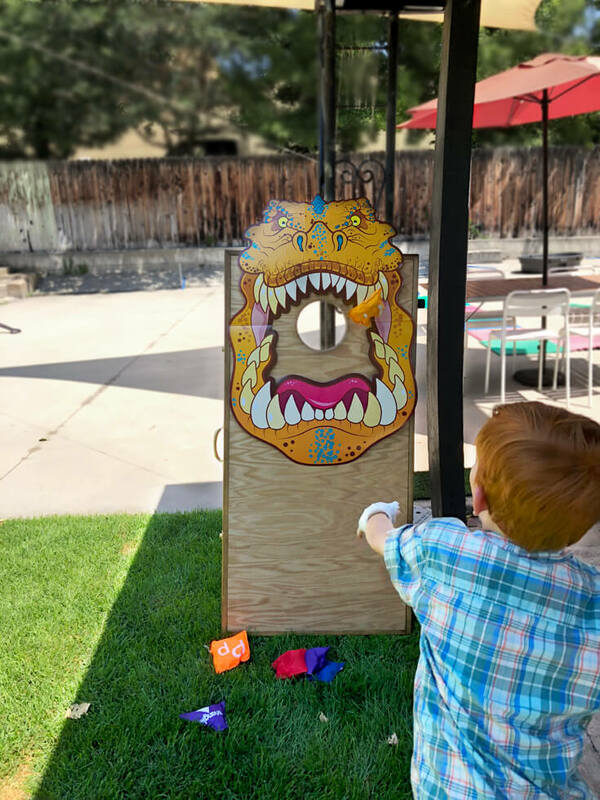 A bean bag toss is a classic party game that never goes out of style and everyone seemed to love it. 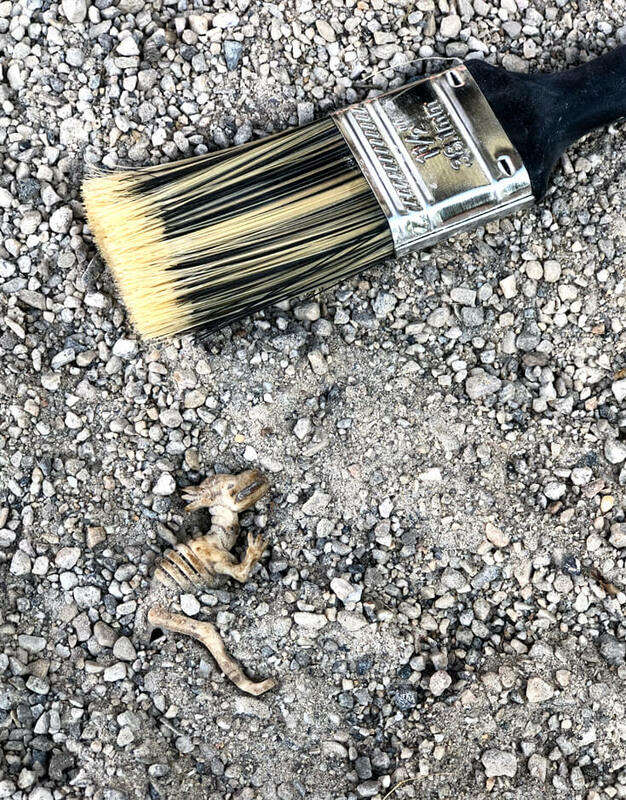 I’ve seen intricate hand painted dino boxes on Pinterest but when I found this T-Rex photo prop from Oriental Trading I knew it was meant to be. We attached it to a corn hole stand and used my alphabet bean bags to feed the hungry fellow. My hubs thought setting it up would be the most fun but proved challenging for our young crowd. After laying it down properly the feeding success rate went WAAAAY up! 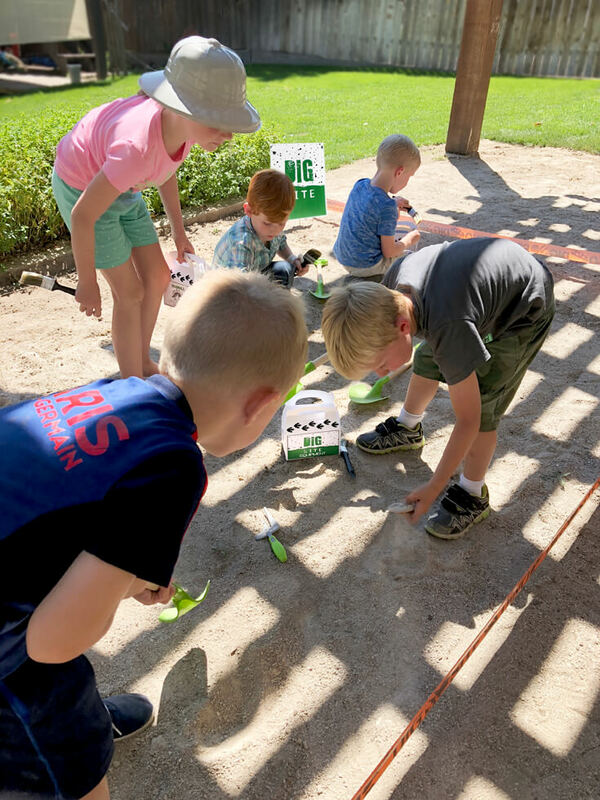 Our little dinosaur hunters had a blast with their “feeding sessions” and didn’t really want to stop. But we moved them along before the bean bags ended up being tossed at each other! I went back and forth deciding whether we NEEDED a corn hole set for this party and I’m super happy with our purchase. We’ve since used it a bunch of times with family and friends. So if you’re on the fence….I’ll give you a nudge. Pro Tip: Keep things moving and switch to a new activity BEFORE they get bored with the existing game. This will deter them from getting “creative” with their play which usually results in rough housing and injury to bodies or property! 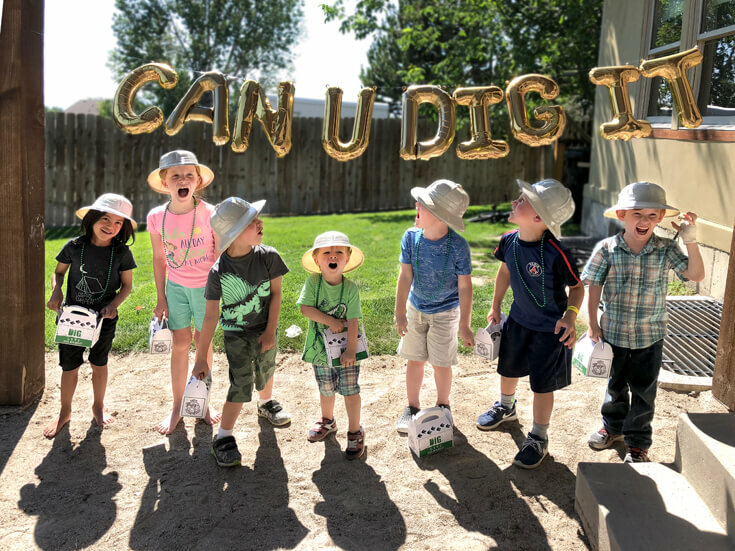 The main event however was a dino dig party activity! I’ve been so excited about this for months. Anytime you have a more intensive party activity start by explaining the ground rules to your guests. This ensures they know what to expect and helps it go much smoother. I also like to add an educational component and talked about paleontology, why it’s important to find dinosaur bones, and how they should be treated when found. 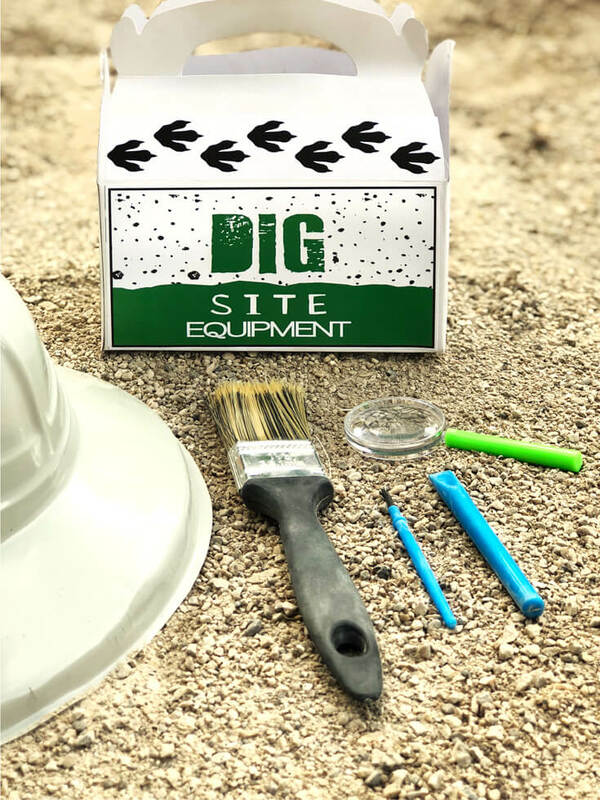 Each child then receives a personalized “Dig Site Equipment box and heads outside to the pit. We’ve been landscaping our backyard and I was dismayed to find out that our deck would not be built in time for the party BUT this cloud had a silver lining in the form of a HUGE sand pit. It’s way better and bigger than what I originally planned. 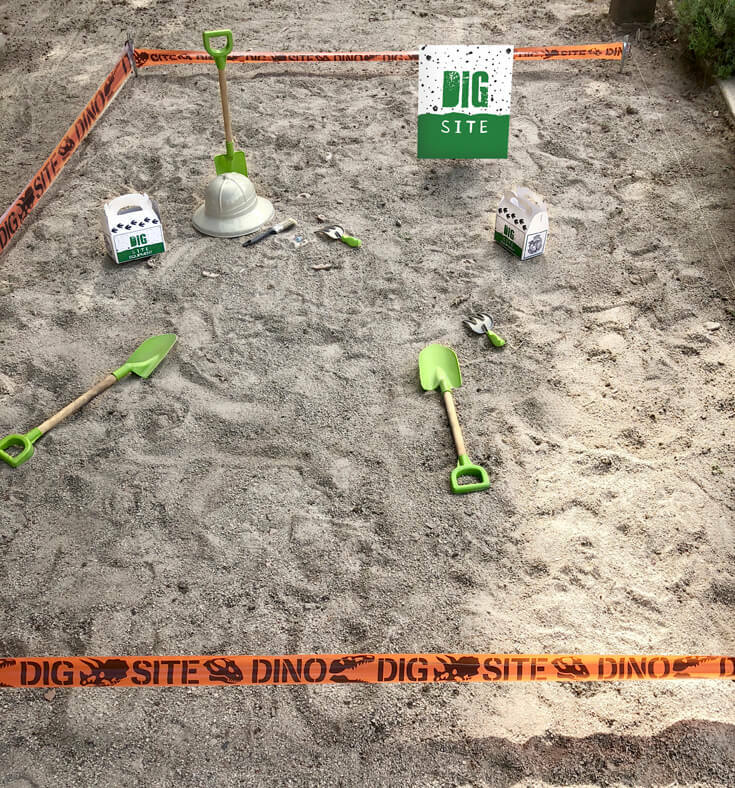 We cordoned off the dig site and buried several fossil options for each guest. 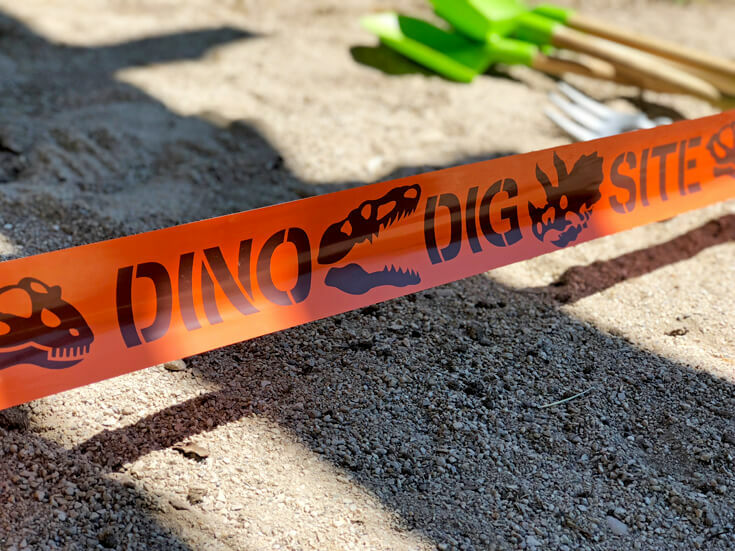 The bright orange dino dig site ribbon, from Oriental Trading, was the perfect way to keep the kids from digging outside the official excavation area. 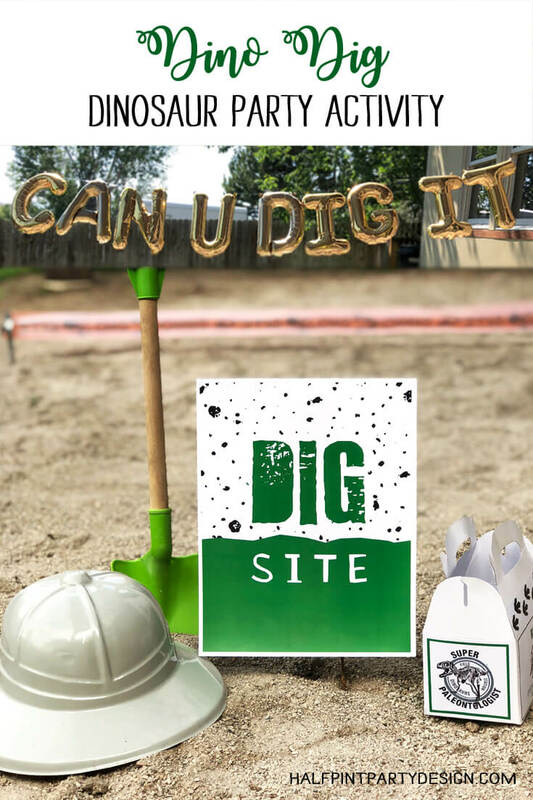 My favorite detail has to be the “Can U Dig It?” Balloon banner that hung to the side of the dino dig site! It was the perfect way to create a “wall” and bring the large open space down to kid scale. A shovel for each child isn’t really necessary, provide some general tools like shovels and rakes for the kids to take turns using. I’m okay with kids having to take turns and learning to work together to accomplish a project. Pro Tip: Plan ahead. By knowing the theme and color palette of my son’s party I was able to pick up supplies on sale over the course of 3 or 4 months and save LOTS of money. Check dollar stores/dollar spot often for anything you can use, cause you’ll end up spending a lot more on last minute purchases somewhere else. After the big digs are done with the shovels break out the dig site equipment. The bristle brush, chisel, and magnifying glass provided the proper tools for more detailed work. When shovels are involved there’s bound to be some flipping of sand. 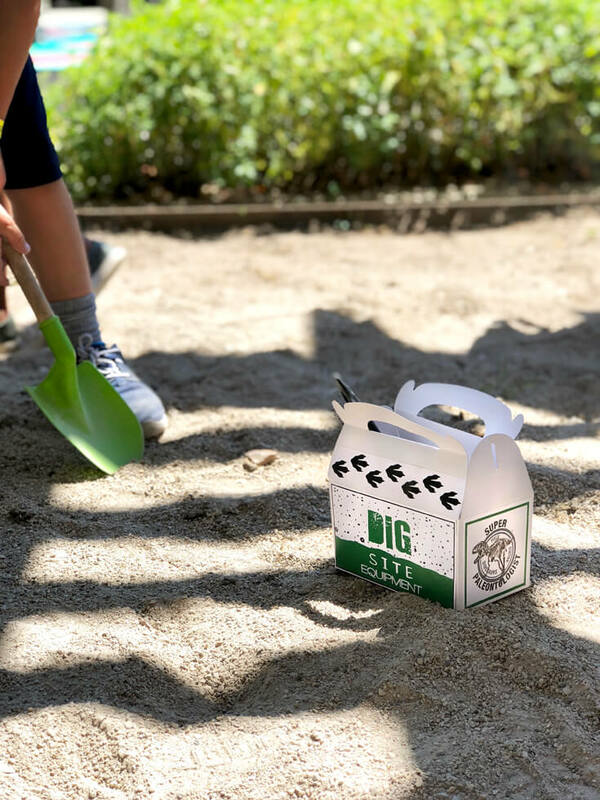 Remind young guests not to lift the shovel up but to push the sand to the side instead. My sweet daughter was the only one who voluntarily wore her pith helmet during the dino dig but they all played along for the group shot and happily took them home. It was so fun to watch them work together and help other friends who hadn’t found their fossils yet. 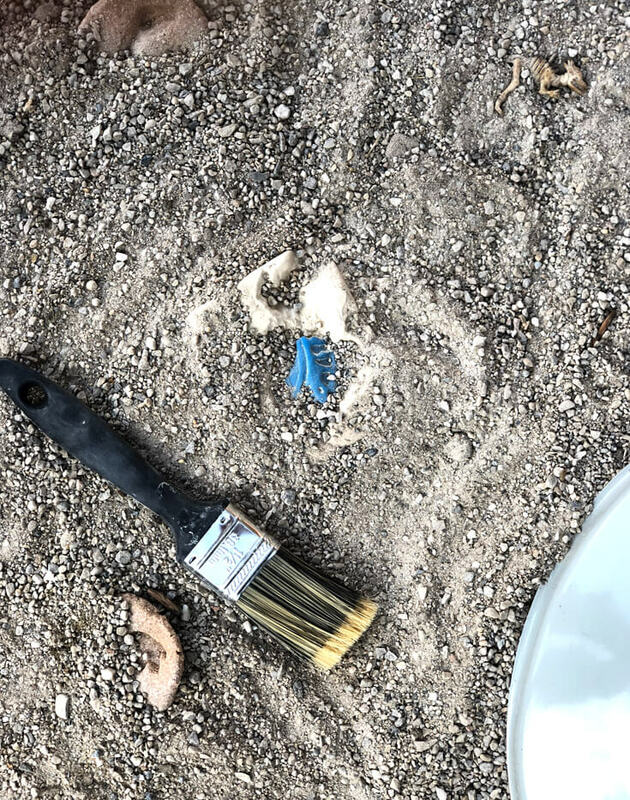 We had a few dozen mini toy dinosaur skeletons buried so each guest was able to find 3. If they found more than that, they were to rebury it and help someone else find it. Some were easily recovered, but others were tricky and blended in a little too well with the sand! 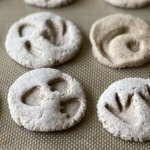 Several dozen salt dough dinosaur fossils were another fun prize that my children helped me to make the week before the party. You can see how easy they are to DIY here. The grand prize for each guest was a clay block containing a rubber dinosaur fossil. After all the fossils were found we moved the party into the shade and proceeded to excavate the fossil blocks. 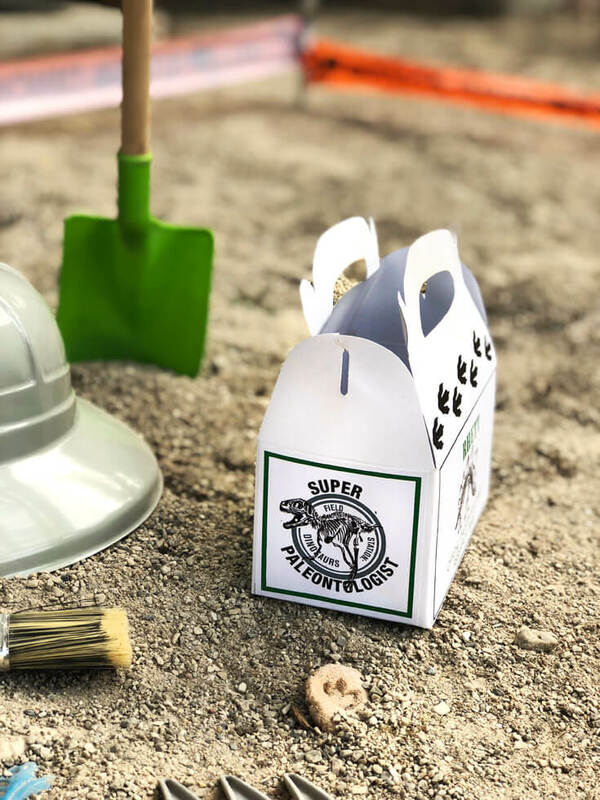 They were a total steal at Target’s Dollar Spot and the kids had a great time chiseling away until they excavated their bones. 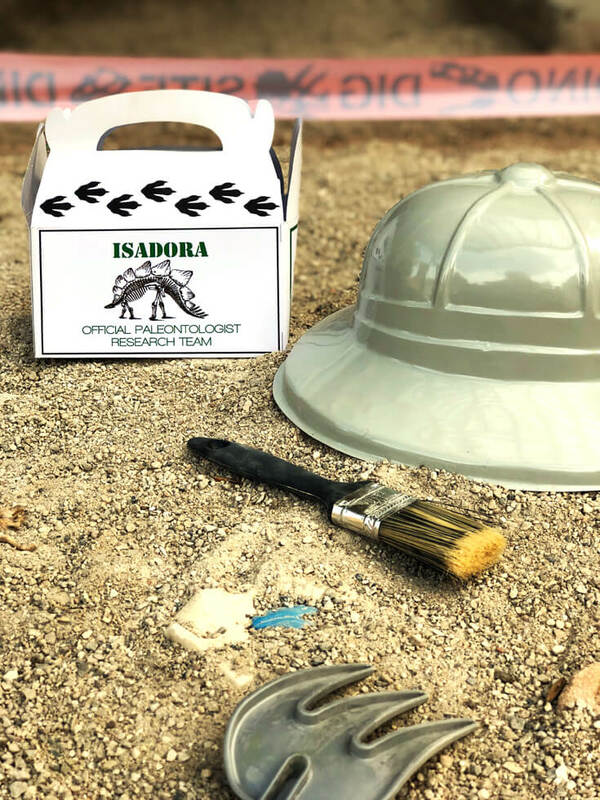 Part of what made the dino dig party activity so much fun was the personalized box for each “Super Paleontologist” as part of the “Official Paleontologist Research Team.” I kind of wish I had made them badges now too! But the plain white favor boxes are so easy to customize for your theme. Just print the files out on full sheets of label paper then cut and stick. It takes a minute to finish all the boxes but is so worth it when you see the magic in the children’s eyes. The favor box printables will be available HERE as a free download until New Years and then they’ll move on over to our Etsy shop. If you know anyone planning a dinosaur party this year or next, please pass this along to them! We headed inside to forage on snacks and swamp water and cool off a bit before going back outside for our final activity. 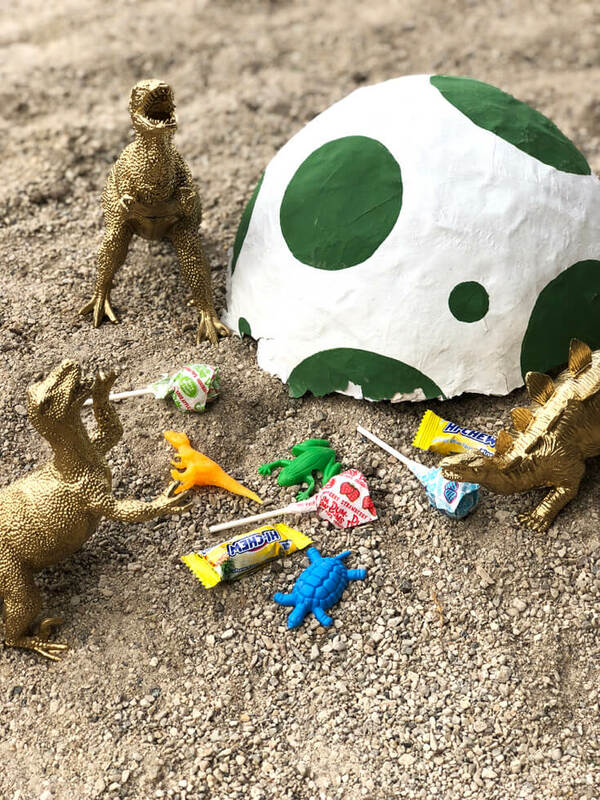 The last dinosaur game was a long awaited and much requested piñata. You can read all about the piñata’s journey to existence here. 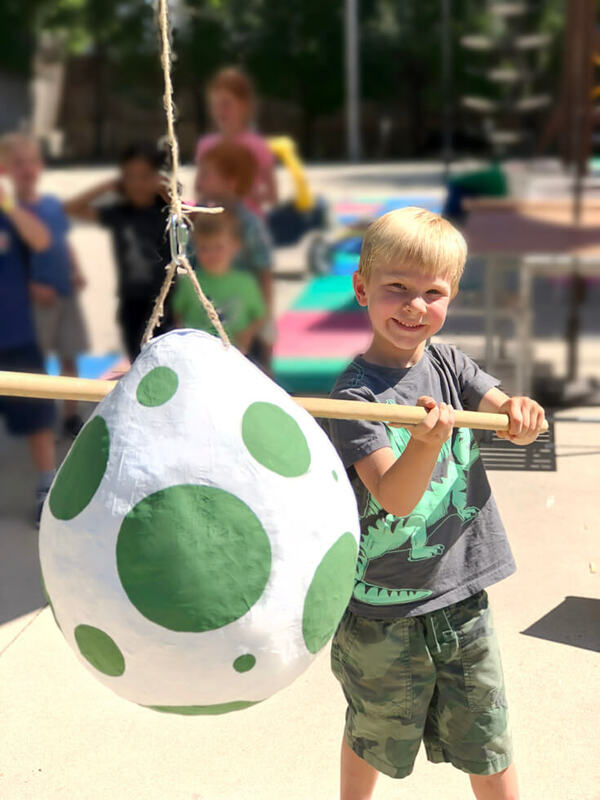 But long story short, I paper mâchéd this dino egg after being unable to find a dinosaur piñata I liked for my dear boy who very much wanted a piñata at his party. 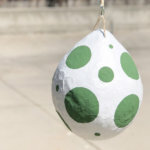 The dino egg piñata was a success, even though it was a bit painful to see it destroyed! Although I don’t think the kids counted on golden dinos moving in to steal their treats! Next time we’ll do a better job at keeping out the riff-raff! What do you think? 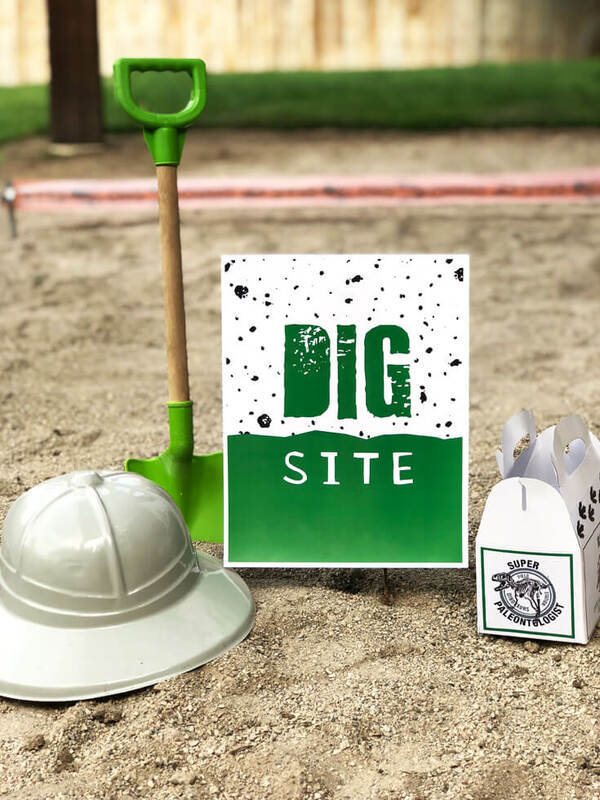 Did you dig this dino dig party activity and other dinosaur games? Cause we sure did! The birthday boy was in dino heaven and made amazing memories with his best friends. Which activity was your favorite? Let me know in the comments below. 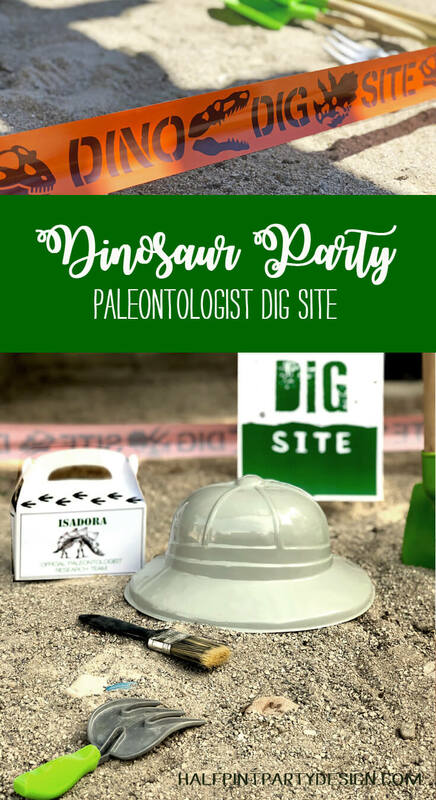 For a budding paleontologist there's nothing better than a dino dig party activity for your birthday! 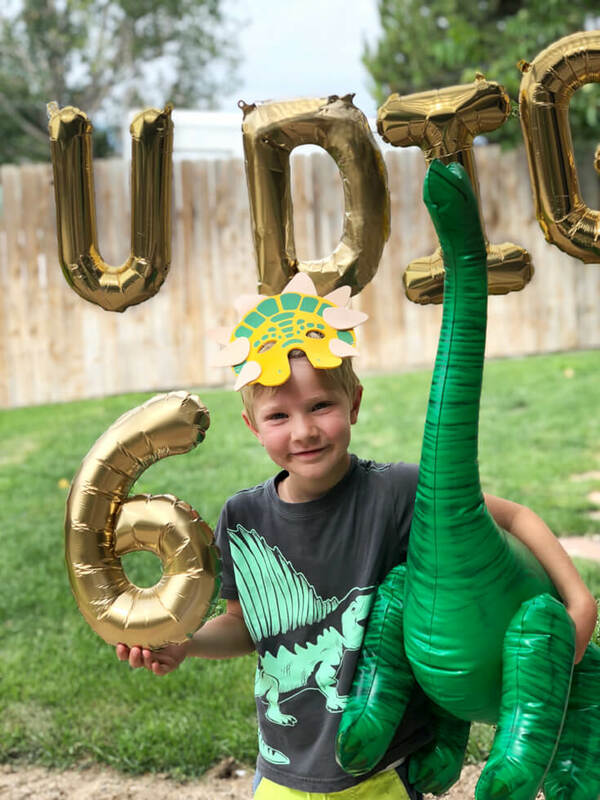 Host a dinosaur party your kids will never forget! I can’t tell you how much I love this party!! My guys would have loved it so much too!! It’s amazing Bri!! Thank you so much! I’m finally ready to unveil the inside portion of the event! It was a pretty fun one for all involved. Bri! You outdid yourself!! This party was so fun and I can see the kids had a blast! Thank you! The activities and the favors are my absolute favorite part of any party. I’m really happy at how well these turned out. This has to be one of the cutest kids parties ever! 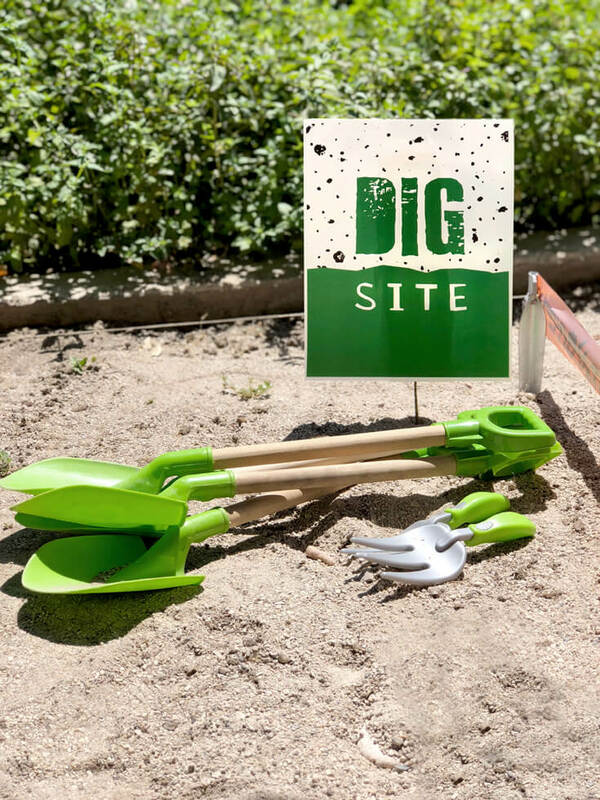 The dig site is absolute perfection! I can’t believe you scored with color scheme and all at Chick-fil-a! Oh thank you so much! It really was a great one. And I knew you’d appreciate the chik-fil-a accessories! I love when I can repurpose, thrift, or dollar store my way into an awesome design! Bri this party looks like it was so fun ! 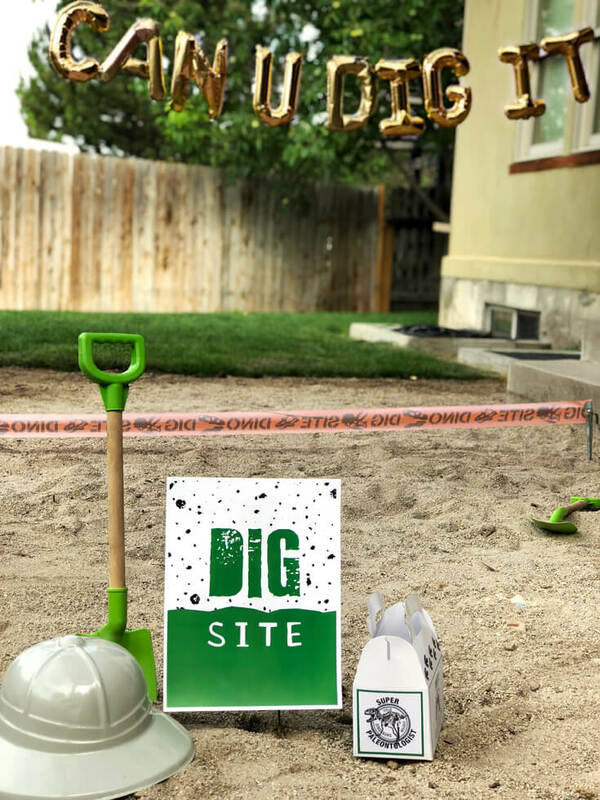 I love the dig site and your photos look amazing friend. Thank you! I really had a fun time designing this one. I was most excited about the dig site. I’m so glad that it turned out well and the kids all loved it. What a great way to entertain the kiddos! Love these ideas! I love having a variety of activities. It’s so fun for my kids to able to plan them with me too. Thank you! Super fun party with lots of great interactive activities! Thank you! It was a super fun theme to play with and I think I might have had even more fun than the kids did! Well I’m so glad you found me too! I hope that I can continue to have fun ideas for you. Let me know if you ever need any specific advice. What an amazing party. 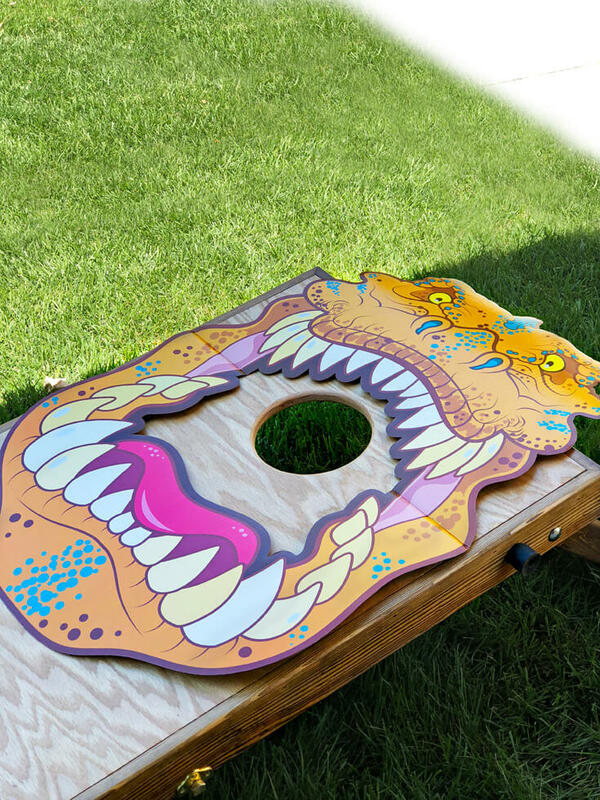 You will not regret buying that corn hole game. You’ll end up using it over and over again at every BBQ! I totally agree! I’ve wanted one for YEARS and we’ve already broken it out multiple times. SO fun. Thank you! Absolutely amazing! some of them are masterpieces. I love to see the creativity growing 🙂 ??? I’m so glad you found me too! I sure love what I do and hope I can help inspire others to throw fun parties with less stress and money! Are the stickers no longer available? No link? There’s a link down below but for some reason the one above disappeared. I’ll make sure I get it added to both places. Thank you for letting me know! I’m so glad you were able to get them to open on your computer. Have so much fun with this party! What a brilliant ideas u shared with us. Great thanks..??? I’m so glad you liked it. Thank you so much for stopping by. 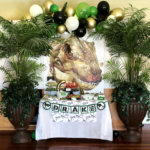 I had a great time with the dino theme if you can’t tell!